The Lakeside Collection, an online and mail order retailer founded more than a decade ago, harkens back to the age of mail-order catalogs that kept generations of shoppers enthralled by page after page of merchandise not typically found in stores. Lakeside is so traditional, in fact, that it still publishes and mails paper catalogs to its customers. The scope of The Lakeside Collection's product offerings is staggering. Categories include housewares, home decor, bed and bath, storage and organization, baby, garden, pets, home improvement, clothing, beauty, books and media, toys and sporting goods and gifts. Shop for items in recent print catalogs, which include seasonal and clearance issues, or browse online-only special offerings. Although most categories have a modest number of product choices, the products are fun and distinctive. The Home collection, which does have many items to choose from, includes such choices as accent rugs, window coverings, cleaning and organizing products, bedding, candles, wall art and lighting. There are home-office products as well. 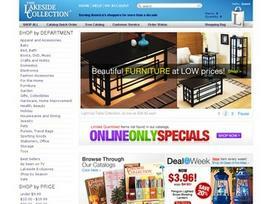 The Home department merchandise is modestly priced, with many sale items offered at any given time. Toys and sports equipment are other strong points for The Lakeside Collection site. There are toys for children of all ages. These are engaging, hands-on, interactive toys that represent a welcome departure from the usual video games and electronic devices. They include games, puzzles, outdoor equipment and creative play. A few adult games, such as a bingo drinking game, are included as well. The books and media section of the site is interesting in that many of the titles are activity books and multimedia sets that combine books with CDs or other media. There are pop-up books, musical books, educational and religious titles, as well as book-game combos. You'll find lots of gift ideas here, such as a six-book paper doll box set and Marvel and DC Museum-in-a-Book sets that trace comic book history with reproductions of early comics and comic memorabilia. Book and media merchandise is well-priced, with many items on sale or clearance. If you thought that handwritten notes were a thing of the past, you'll be pleased to know you can find a lovely collection of stationery at The Lakeside Collection. Note cards, writing paper, desk sets and journals are just a few of the items that paper lovers will be delighted to browse. A fun addition to The Lakeside Collection's product offerings is As Seen On TV items that have been featured on television infomercials but are difficult to find in stores. The Sale category makes it easy to shop for bargains across product categories. The offerings included here rotate, but they often include apparel, stationery and toys, and the discounts can be substantial. The Lakeside Collection is the perfect site for shoppers who yearn for a time when mail-order catalogs filled their mailboxes. The products, and even the catalogs themselves, which customers can order online, will transport you right back to those days. Share what you think about The Lakeside Collection, and your favorite ways to save there! I'm ordering a gift for my wife. like the stuff. its inexpensive. Great place to shop for gifts and special occasions. They carry some unique items I have not seen at other online stores. Can't beat their prices either. This is the perfect site to find gifts and holiday decor without breaking the bank. The items are distinctive and I'm anxious to begin my holida6y decorationing as soon as my package arrives! So many items at such good deals. Fair pricing on many cool items. I love everything I get from there. Good ideas and inexpensive items. hope this works this time!! I enjoy receiving the catalog even though I have no yard. It would be nice to have more offers for personal use. Best catlogue and great products. I have been satisfied with my purchases. They have some great products.